‘Tis the season for pumpkin spice and everything nice! 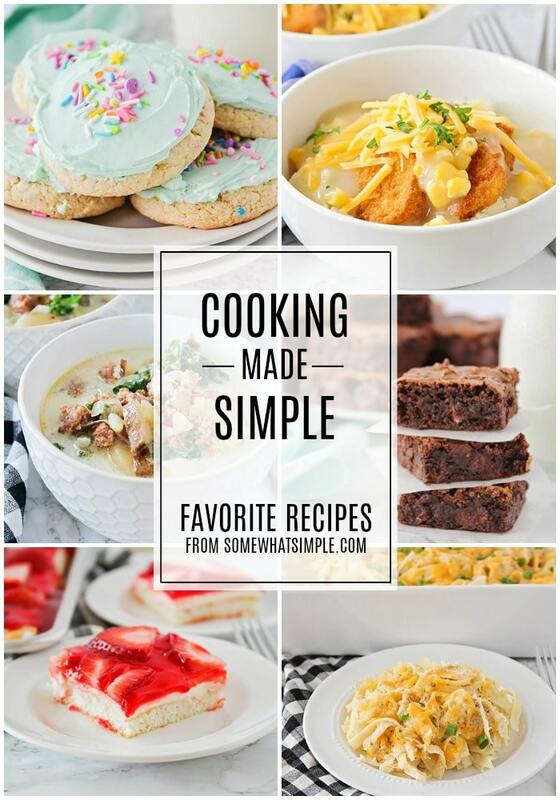 Here are 30 favorite pumpkin recipes! 1. 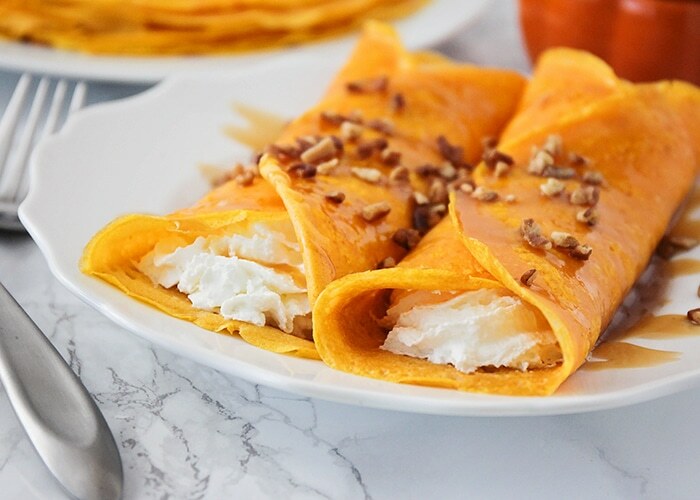 Pumpkin Cheesecake Crepes – Your breakfast cravings are about to be satisfied like never before! 2. Three Ingredient Pumpkin Cookies – So easy to make and they taste DELICIOUS!!! 3. 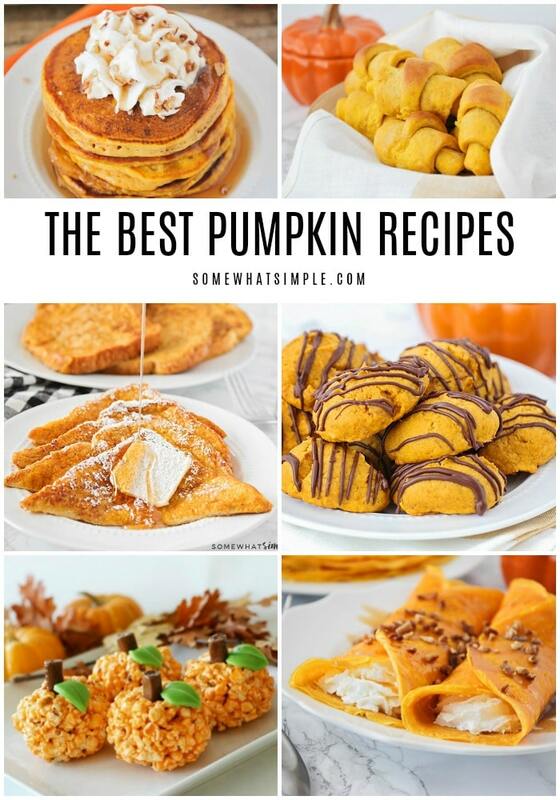 Pumpkin Pie Turnovers – They taste just like pumpkin pie, but come together so much easier! 4. 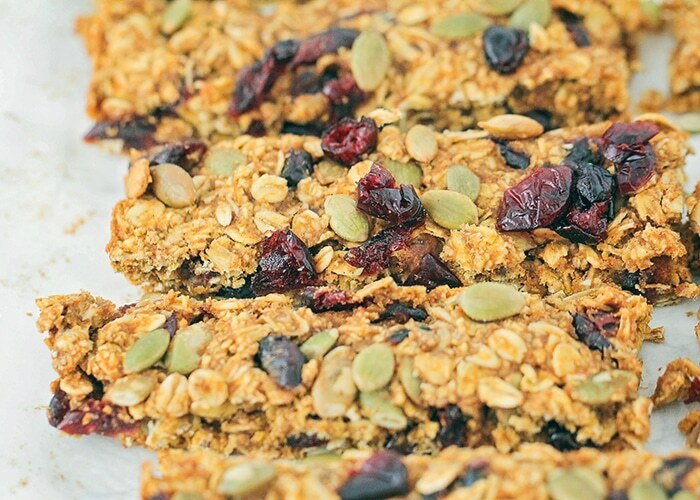 Pumpkin Granola Bars – Loaded with dried cranberries and pumpkin seeds, they are a super delicious fall treat! 5. Pumpkin Pie Baked Oatmeal– All the delicious flavors of pumpkin pie, but in a healthy, easy to make ahead breakfast. 6. Pumpkin Spice Brownie Brittle – Every piece is crunchy and delicious! 7. 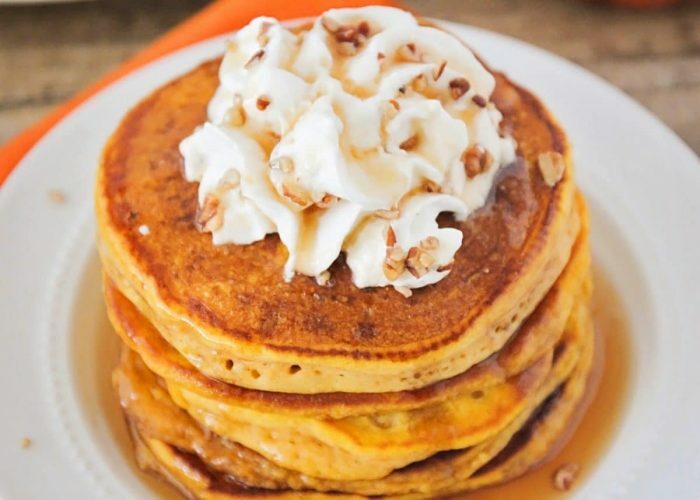 Pumpkin Pancakes – Light and fluffy, with the perfect pumpkin spice flavor. 8. Pumpkin Empenadas – Simple to throw together, not to mention a fun way to get kids to eat something half-way decent before they go trick or treating and have a candy overload! 9. 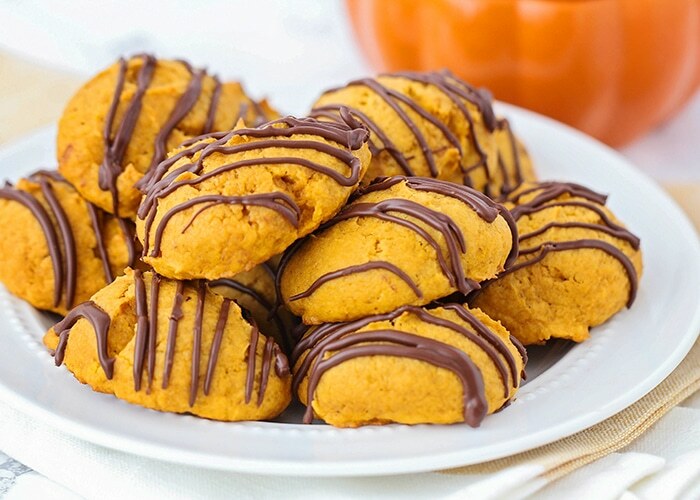 Pumpkin Cookie Bites – Tastes amazing and uses only 3 ingredients! 10. 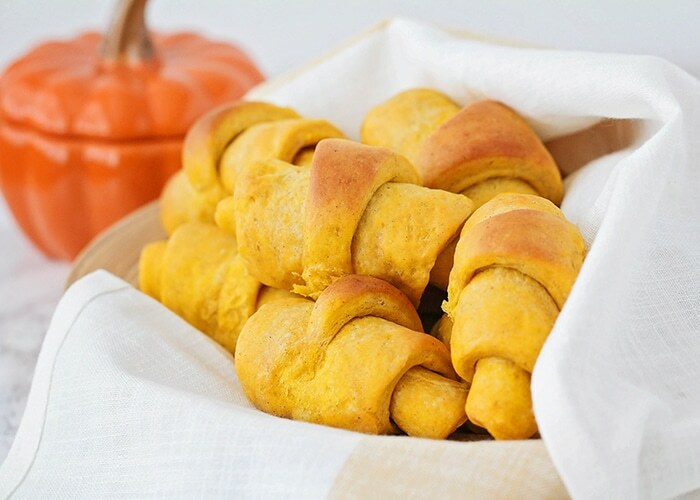 Pumpkin Rolls – Tender and light, with a delicious hint of pumpkin spice, this pumpkin roll recipe makes the perfect addition to any fall meal! 11. Pumpkin Muffins – There’s nothing better to wake up to than earthy, spicy and soft homemade Pumpkin Muffins. Add some streusel to the top and you have the perfect fall breakfast or afternoon snack! 12. Whipped Pumpkin Honey Butter – The perfect way to spread a little bit of fall goodness on your baked goods! 13. Pumpkin Cookies with Chocolate Glaze – Grab a tall glass of milk and get ready for these super delicious, super easy pumpkin cookies! 14. 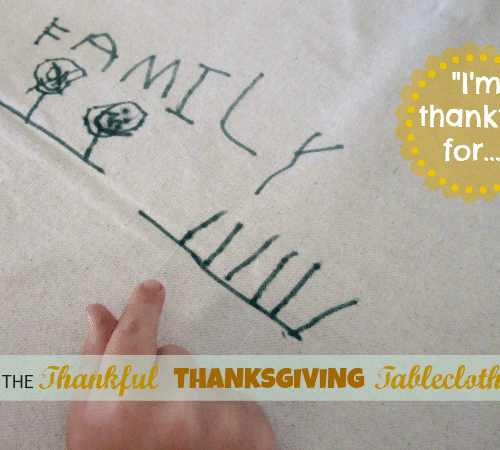 Pumpkin Pie Bars – A great substitute for pumpkin pie at Thanksgiving. 15. Pumpkin Waffles from Cooking with Curls – They are light, and fluffy and perfect on a fall morning. 16. 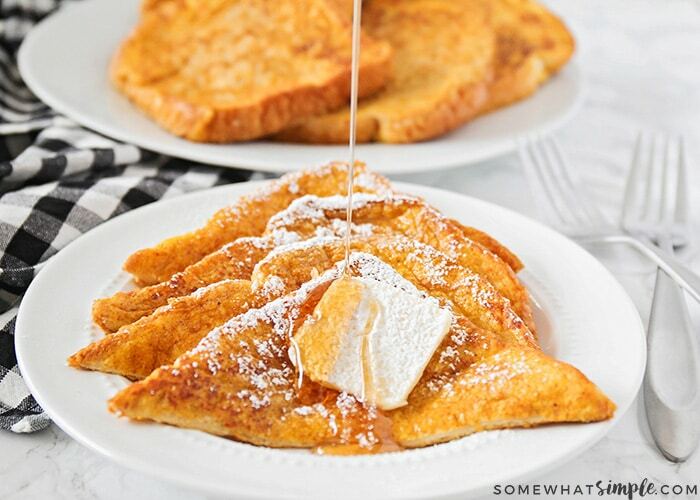 Pumpkin French Toast – This simple and delicious pumpkin french toast is a great way to start the day! 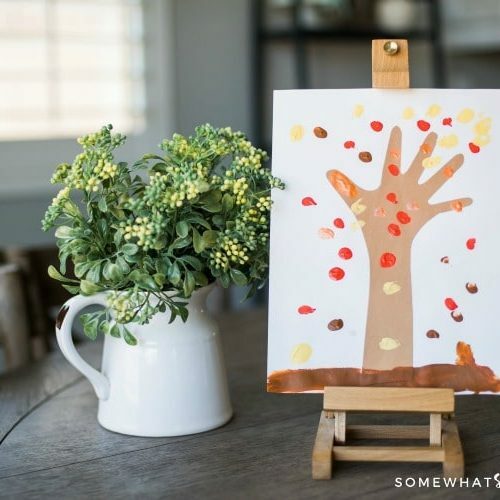 It’s easy to make, and has the perfect pumpkin flavor! 18. Pumpkin Chocolate Chip Cookies – With the perfect amount of pumpkin spice and chocolate chips, these soft and delicious cookies will quickly become one of your favorite cookie recipes! 19. 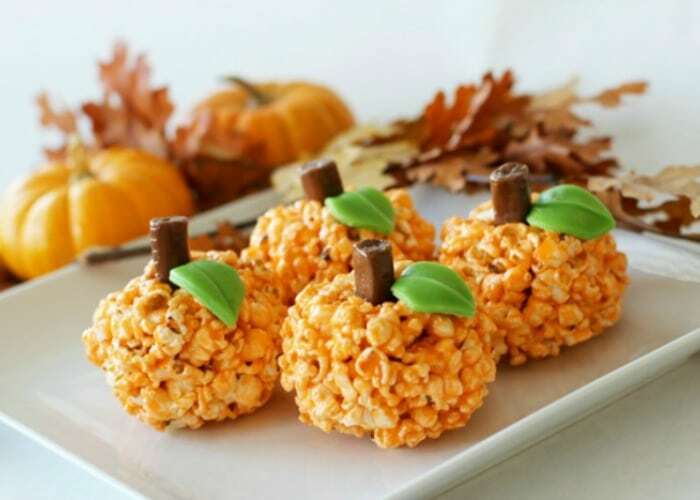 Easy Pumpkin Popcorn Balls – A fun fall treat that are perfect for any party! 20. Pumpkin Coffee Cake in a Mug – A single-serve pumpkin coffee cake that can be make in the microwave in under 5 minutes. 21. Pumpkin Churros from The Novice Chef – The Cinnamon Pumpkin Cream Cheese Dip to pair with the Pumpkin Churros is perfectly divine. 22. 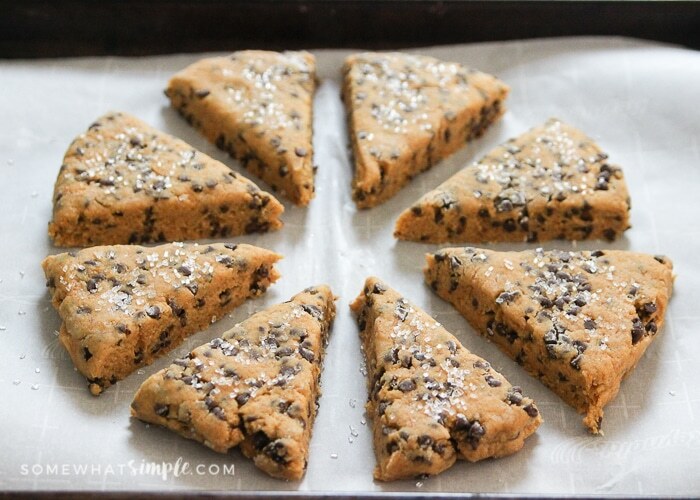 Pumpkin Chocolate Chip Scones – Sure to become one of your new fall favorites! 23. Pumpkin Pie Smoothie from Shugary Sweets – The perfect, healthy way to start your day (or recover after a workout)! 24. Pumpkin Poop – A hilarious Halloween treat or snack that kids of all ages will absolutely love! 25. 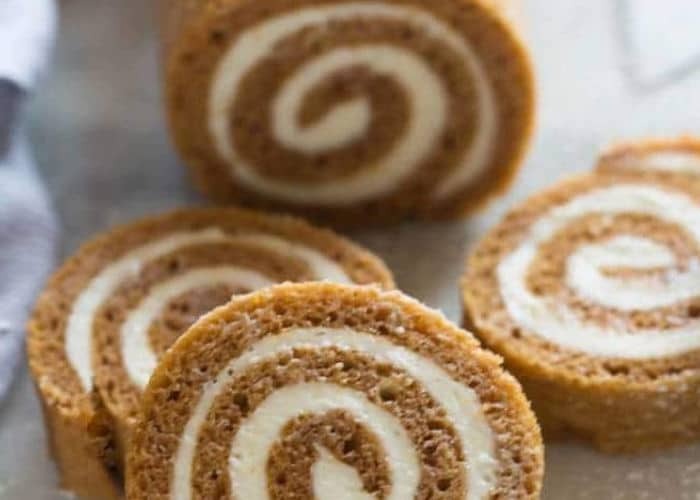 Pumpkin Roll – A classic recipe with cream cheese filling and an important trick for making the process easier and less-messy then ever. 26. Pumpkin Pie Sugar Scrub – A simple and delicious smelling DIY for yourself or gift idea for the holidays! 27. Throwing Up Pumpkin Guacamole – What screams Halloween more than having a pumpkin throwing up everyone’s favorite dip! 28. 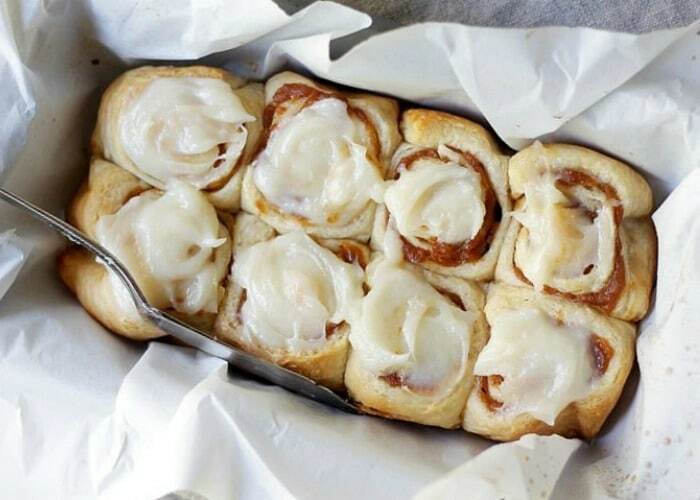 Pumpkin Cinnamon Rolls from The Diethood – Cinnamon Rolls in under one hour made with refrigerated dough + a delicious pumpkin filling and cream cheese frosting! 29. Pumpkin Cream Cheese Coffee Cake – Tender pumpkin cake with a sweet cheesecake layer, topped with a cinnamon pecan streusel. 30. Homemade Pumpkin Puree – The effort required is so minimal, and the payout is awesome!